An injured spouse form or forms are tax forms filed by a taxpayer’s spouse who has filed a joint tax return and has made an over payment in taxes, requesting a refund of the over payment being used in offsetting other past federal or state income tax obligations. The over payment can also be used to offset student loans and child/spousal support. The spouse filing these Sample Forms should be free from legal obligations to repay the debts being offset. This form is filed by the injured spouse who must have received income, filed a joint return with the spouse owing the debt, made withholding and estimated tax payments and made an overpayment which will be applied in full or in part to offsetting debts owed by the spouse. 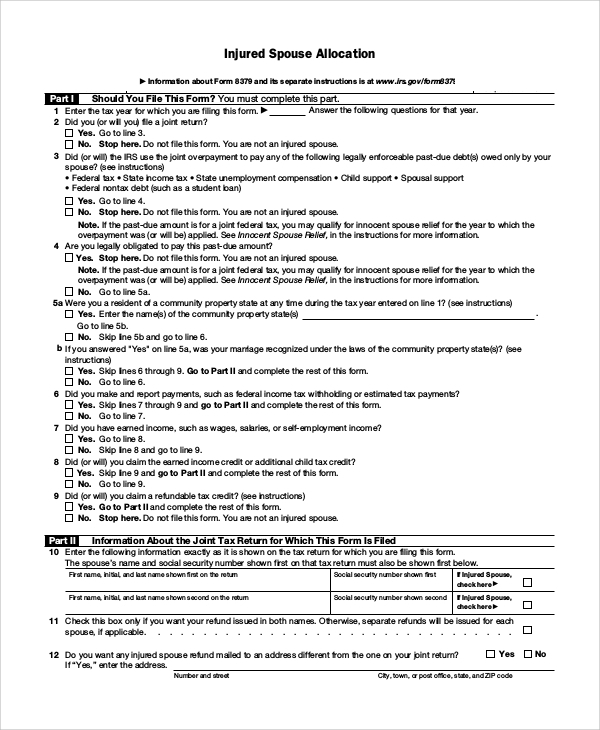 This form is a response to the Injured Spouse Tax form requesting for joint tax refund and one that gives IRS enough time to determine the injured spouse’s portion of the income tax refund and the amount to be credited to the account. 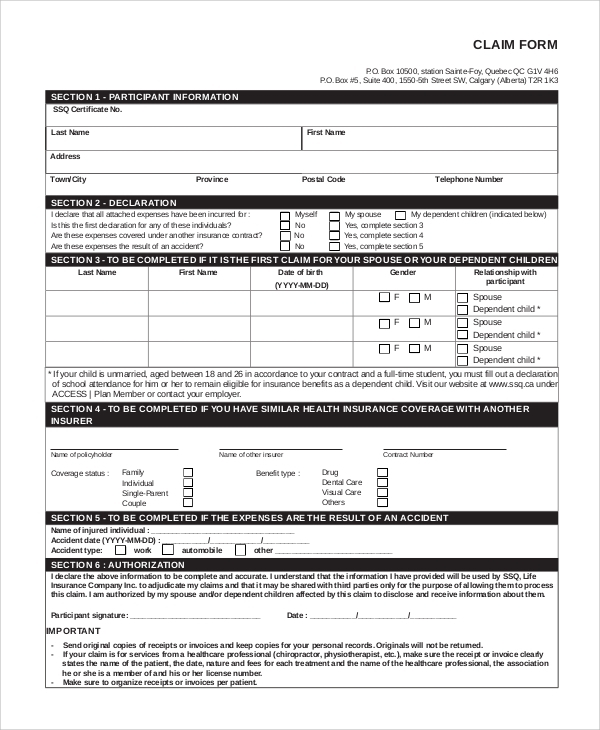 This is a form filed by the injured spouse requesting relief from any liability that applies solely to the current/former spouse or tax liabilities resulting from the other spouse’s actions in a joint return. 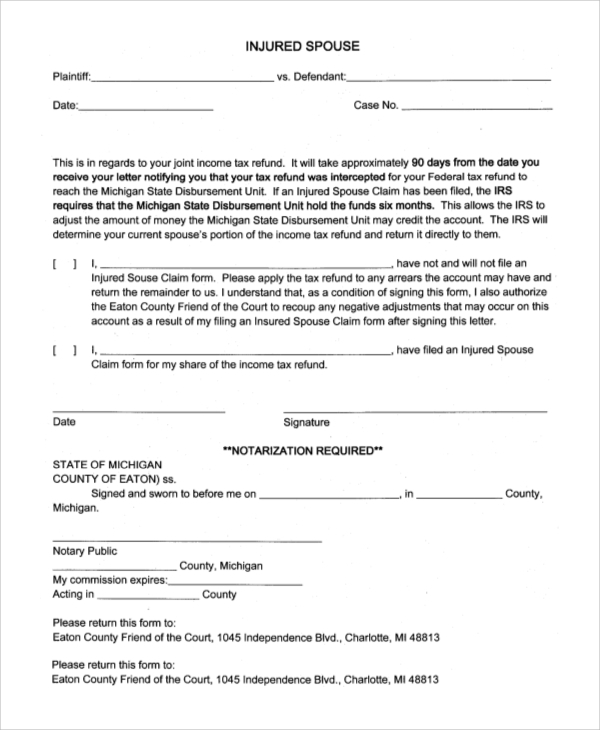 This is a form filed by the injured spouse for the tax refund from a joint tax return. One must not be liable to pay past-due debts, must have reported payments on the joint account as well as reported income on the joint return to qualify. 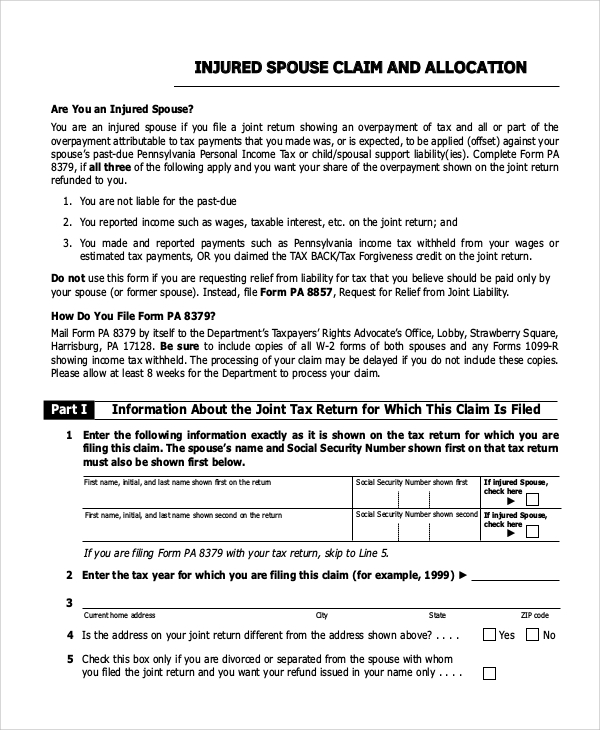 This is a form filed by the injured spouse requesting for the disclosure of critical information to both the taxpayer and the spouse in addition to the information needed to determine the amount of tax or refund attributable to each spouse. 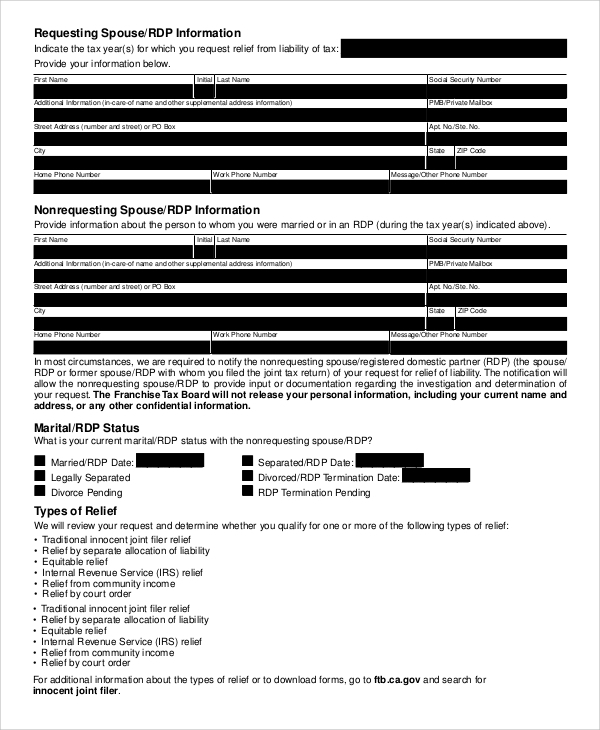 What Is The Purpose Of The Injured Spouse Sample Forms? 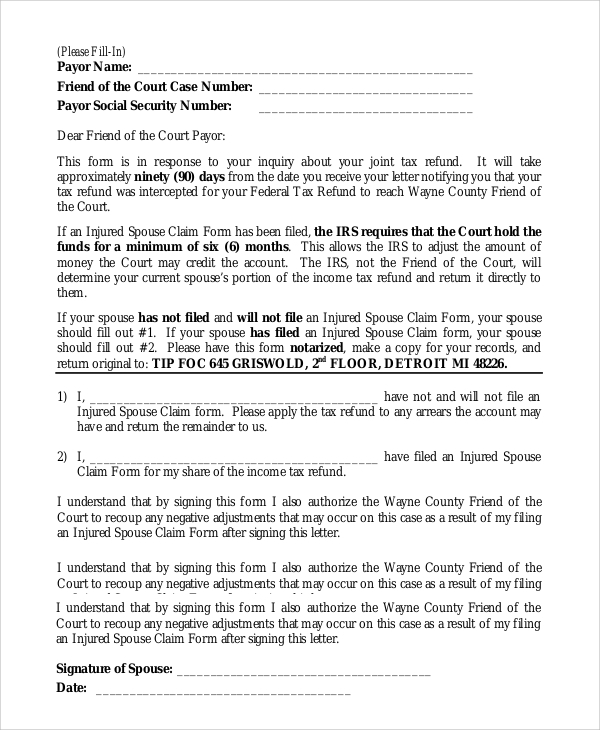 Injured spouse sample forms are used by the injured spouse whose joint tax return refunds are applied to offset debts owed to the other spouse. Any debts like student loans or past due state or federal taxes were not owed by the spouse, then it is their legal right not to pay them. The fact that your tax refund is subject to your spouse’s debt, makes you the injured spouse. In this case, you can exercise your legal rights by filing the aforementioned Incident Reporting Forms to legally and successfully claim for your portion of the tax refund. 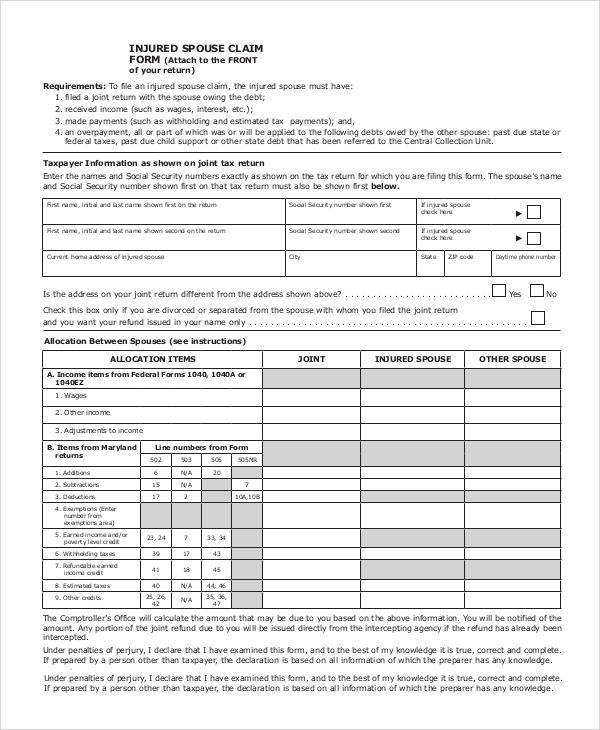 Who Is Qualified To Use The Injured Spouse Sample Forms? To know that you are an injured spouse fit to use the injured sample forms, you and your spouse must have filed a joint tax return. If you meet the criteria for claiming tax refund credit, be it an earned income credit or a child tax credit, you qualify to be an injured spouse. You must also have reported taxable incomes showing estimated tax payments or income tax withheld during the tax year. Last but not least, you must not be legally liable for any past debts being offset otherwise if you jointly owe the debts, you will not be considered as an injured spouse. Having known who an injured spouse is, and your legal rights, do not sit back and watch when you find yourself in such a scenario. The Sample Incident Report Forms will give you simple and easy to follow instructions that will take you through the seemingly confusing process in no time.